Arsenal signed goalkeeper Bern Leno in the offseason. Rumors have been swirling about when, not if, he'll takeover as their top choice keeper. Three summers ago, Arsenal signed Petr Cech away from Chelsea, and with that signing, Arsenal had hoped to sure up their defense. In an Arsenalesque sense of optimism, Arsene Wenger thought bringing in a great goalkeeper would solve their defensive woes. Many fans, however, knew that the real problems were in front of the goalkeeper. Without a solid defense, a goalkeeper cannot be effective. This led me to thinking about how Cech's first three seasons compared to his first three seasons with Chelsea, when he was widely considered one of the best goalkeepers in the World. 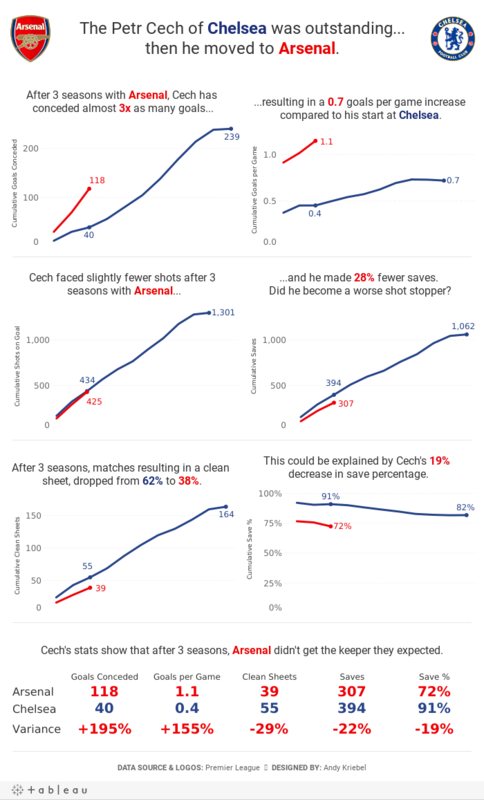 The data shows that Arsenal more or less ruined him. Or did Chelsea's stellar defense make him better than he really is?